Yesterday, Jon and I, Natalie, Tom, our son Chris, and two other great employees, Beth and Matt, made available our history of Central Florida running. 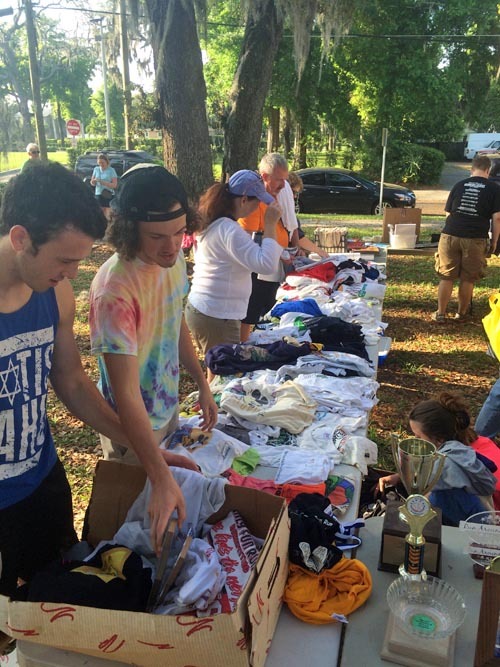 It took several weeks of organizing, but we raised more than $400 for our Track Shack Foundation as we welcomed runners, old and young, into the yard behind our warehouse to view scrapbooks, photos, results of races years gone by (even before computers) and encouraged everyone to take shirts, old magazines, books, photos and more. Chris set up the music from the 70's and 80's as we all reminisced the past with each other and friends who stopped by. It was a great day and the fact that it helped us organized much of our past records was a plus. Stop by Track Shack and enjoy our history in the back hallway and throughout the store. 2015 has started with a bang and we'll continue making running history each and every day. See you on the roads!